One of the things that people may be surprised to know about Herbalife is that you can’t purchase it in any store. You might be able to find some from a local distributor at a local nutrition club, but because of Herbalife rules and regulations, those aren’t always advertised. If you don’t know what you’re looking for, you might drive right by one. The next thing you might think is that you can buy it on amazon or ebay. This is the worse place to purchase, because you don’t know anything about the distributor who is selling and the products may be expired, or worse, counterfeit. Herbalife does not permit active distributors to sell via these methods, so if you see products on any online auction site, you can rest assured that it isn’t fresh. So, where can you purchase Herbalife? There’s really only one option. Your local Herbalife Independent Distributor. However, it may seem like it’s hard to find a distributor, because they aren’t listed at Herbalife.com. There’s really only one place to find a local distributor, and that’s right here at http://herbal-nutrition.net. Just click here, and enter in your city name or zip code and you’ll see a list of active, reputable distributors who are ready to help you find the products that are right for you. What are you waiting for? Let’s get your products today! We’re proud to be the world’s most popular independent source of retail websites. If you have a team in other countries, please don’t hesitate to let us know and we’ll see if we can “open up” that country to our services. Coming soon….. HNN Mexico and HNN France! One of the best features of HNN is our ability to help drive local customers to your HNN website through our “locate a distributor” feature on the HNN Homepage. We’re proud to announce that Zach has just made this feature even more accurate and easier for potential customers to find your HNN website! 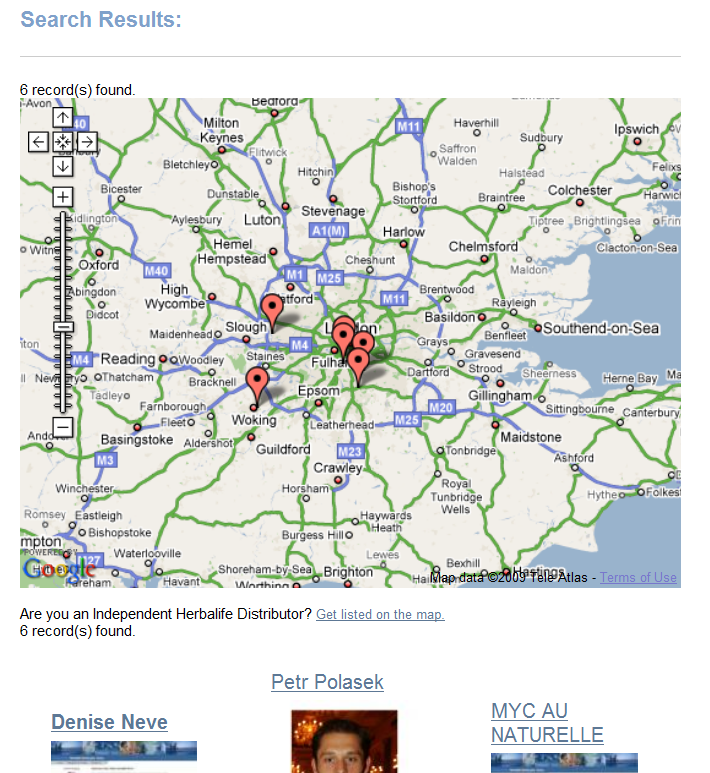 We’ve added a “Google Map” to the results page so customers can get a better idea of where each distributor is located. Also, this feature will work for all of the countries which our services are available in. It will also work in countries we’re working on, including India, South Africa, and Malaysia. This will enable us to add new countries to the site more easily, and will help with our roll outs of Mexico, Ireland, and France (among others). The search box is also much more forgiving, as you don’t have to have a zip code to do a search now… you can even search major metro areas by using the city’s name, such as “New York”, or “London”. 1.) New Visitors – we use some fancy code to look up their “IP Address” and then use a third-party service to lookup their city and state. We then find a “local distributor” and place in the “Featured Distributor” section at the top of the page, along with their city prefilled into the “Search for a Distributor” text box. They can either shop directly from the “Featured Distributor” on the homepage, or search for more local distributors and find one that’s closer (if they wish). 2.) Repeat Visitors – Once someone has visited your HNN webiste, we’ll store your information as their “Featured Distributor”, so next time they visit HNN, they’ll automatically see YOU as their Featured Distributor. That way, if they’ve forgotten your HNN username, they can still easily find you from the HNN homepage. Try our new search now, and then let us know what you think! Looking for another source of free local traffic? Check out this great tool from Google to help promote your HNN website locally! Promote Your Distributorship Locally in Google! Are you looking to boost local traffic to your HNN website? What if there was a great new way to get local search traffic to your HNN website – without spending a penny? Local search results in Google. Click for larger image. One of the great things about the Herbal Nutrition Network is that we provide visibility for distributors who are using our services. 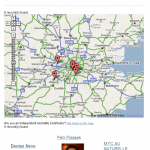 The locate map on our homepage is designed to send local traffic directly to your HNN website. And since Google is the most popular search engine, you can now increase the likelihood that someone will find you by adding your business information to Google’s new Local Business Center. The local business center is a free service that will allow you to customize the way your business listing appears in Google. You’re able to customize the way your listing appears – you can even link the listing directly to your HNN website and add current promotions and coupons to the listing! As search engines continue to increase their emphasis on local search results, we only expect to see more localized results from search engines in the future. 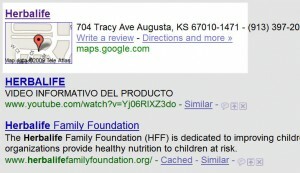 Above is a screenshot of a search for “herbalife” in Google on 8/17/2009. The local result appeared automatically about halfway down the page. I did not specify a city name, I just searched for “herbalife”. 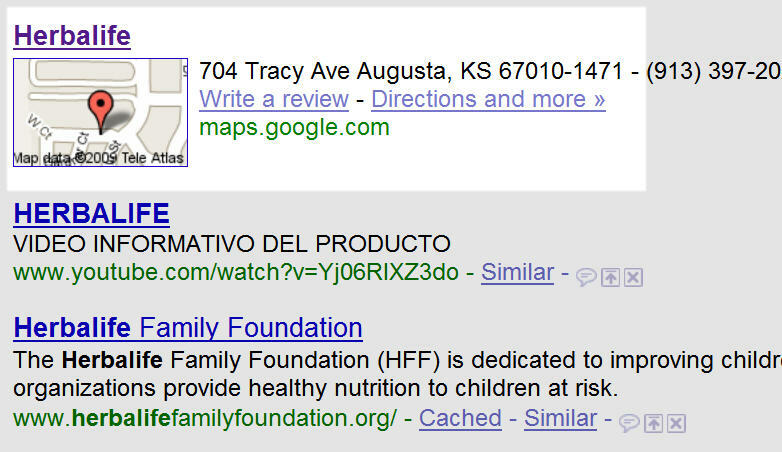 If you search for “herbalife, Wichita, KS”, you’ll also see local results – but higher up on the page. This is a relatively new feature from Google, so you can expect to see the listings change from day to day, but we think this is a fantastic opportunity to position your Herbalife distributorship for local growth. You can read more about the Google Local Business Center here, or you can add your HNN website to the Local Business Center here. As you add your listing, don’t forget to add your complete HNN address to the listing, including your username. Also, if you don’t want your home phone number in the listing, check out Google Voice. This is another free tool from Google that allows you to create a new local phone number for free. The Google Voice number will ring the phone number(s) of your choice and even comes with free voicemail.